The author began his career writing for Atlantic City magazine in 1985, and his fascination with the life and times of Paul “Skinny” D’Amato dates from that point. Born in 1908, one-time convicted gambler D’Amato blossomed along with the city of his birth. Van Meter documents that fruitful era under Atlantic County Sheriff Enoch “Nucky” Johnson, who became a political superboss by recognizing that all it would take to make a bland stretch of New Jersey beach into a vibrant, all-things-to-all-comers resort was for the cops to know exactly when to look the other way. 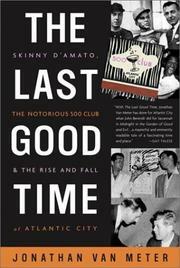 While the law did exactly that for the three decades of Johnson’s reign and beyond, Skinny grew up and became the owner-founder of the 500 Club and, concurrently, the quintessential go-between in the creation of Frank Sinatra’s Rat Pack as well its dealings with peripheral figures like Joe DiMaggio and Marilyn Monroe, the mobster Sam Giancana, his girlfriend (Judith Exner), and her boyfriend (John F. Kennedy). The club boomed with its times: dropping in during the 1950s, you’d find Martin and Lewis testing their onstage chemistry, while those hanging out by the bar included, say, Elizabeth Taylor, Milton Berle, Liberace, and Grace Kelly. The author unravels colorful yarns (some familiar) gleaned from interviews with Skinny’s family, friends, and former employees, but things lag somewhat during a detailed analysis of the transition in business-as-usual wrought by the crime-busting Kefauver Commission. As the ’60s unfold, Skinny yields to what seems in retrospect a biblical temptation by leaving AC to run Sinatra’s Cal-Neva Lodge at Lake Tahoe. It’s the beginning of the end as Marilyn overdoses, JFK travels to Dallas, and Atlantic City lapses into tenements and white-elephant hotels to await a new Casino Era.